My (re-)compositions based on birdsong celebrate and illuminate, rather than improve on, the avian achievement. My works for strings focus on issues of rhythm and bowing, from dance forms and compound meter to how classical players can appropriate extended techniques from non-traditional styles. Hollis Taylor is a unique figure in music. Once the youngest member of the Oregon Symphony and concertmaster/soloist at Wolf Trap Center for the Performing Arts in Washington DC, she went on to win the Oregon State Fiddle Championship. Since then, she has continued to defy categorisation. Taylor playing is featured in two Gus Van Sant films, My Own Private Idaho and Even Cowgirls Get the Blues. The American Center in Paris awarded her a two-year residency at the Cité Internationale des Arts for 1993-94. While based in Paris, Taylor performed and recorded jazz and folk music throughout Europe. She is the author of six books of American fiddle transcriptions and arrangements and regularly contributes in-depth articles, interviews, and music criticism to Strings, Stringendo, and Fiddler magazines. As a composer, Taylor also blurs the lines between classical, jazz, and folk. European folk music in compound meter-inspired Unsquare Dances (1995), composed during a year's residence in Budapest, Hungary. Trail Mix for Five Scordatura Violins was the 2000 First Prize winner in the National League of American PEN Women. Box Set is Taylor's re-take of the J. S. Bach Solo Violin Partita in B minor, reflecting Afro-Cuban, bebop, blues, and funk sensibilities, the product of a 1997 artist's residency at Altos de Chavon in the Dominican Republic, awarded by Parsons School of Design in New York City. In 2000, she received grants from the American Composers Forum, Meet the Composer, and the Portland Baroque Orchestra to compose Groove Theory, a violin concerto for British Baroque violinist Monica Huggett. Recent commissions came from The Song Company and from Genevieve Lacey (supported by a grant for New Work from the Australia Council) for works based on the vocalisations of the pied butcherbird. Other commissions include from the Elements Quartet of New York City for a string quartet debuted at Lincoln Center, and from ABC Radio National/Sydney for a radiophonic piece on the life of anthropologist Olive Pink. The New York-based string quartet Ethel regularly tours with several of her compositions. Taylor's sound/video installation Great Fences of Australia, in collaboration with Jon Rose, has seen numerous international performances. She has written a full-length book entitled Post Impressions based on her and Rose's 35,000 kilometre journey as cartographers making a sonic map of the great fences of Australia. Taylor was born in the USA and has been a Sydney resident since 2002. Her PhD from the University of Western Sydney is on the song of the Australian pied butcherbird. 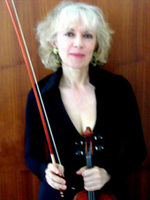 Her portfolio of compositions based on birdsong won the 2008 UWS APRA award and was featured on ABC Classic FM's New Music Up Late and at Violinale 2009 in Berlin. Taylor is a Research Fellow at Macquarie University, Sydney in the Department of Media, Music, Communication and Cultural Studies. Her research focuses on three Australian avian species-pied butcherbirds, lyrebirds, and bowerbirds-as she reflects on animal aesthetics, human exceptionalism in the arts, and the natureculture continuum. She lectures worldwide on The Music of Nature and the Nature of Music Her award-winning (re)compositions of pied butcherbird songs are supported by a grant from the Australia Council. Her monograph, Is Birdsong Music? Outback Encounters with an Australian Songbird, is forthcoming. Previous posts include as a Research Fellow at the University of Technology, Sydney, the Laboratoire d'Eco-anthropologie & Ethnobiologie in the Muséum national d'Histoire naturelle, Paris, and the Institute for Advanced Study in Berlin. Lamington Plateau : flute solo (2008) Commissioned for Jim Denley. Blue circle : string quartet (2004) Commissioned by Fear No Music ensemble. Corfu '72 : for string quartet (2002) Commissioned by Elements String Quartet. Groove theory (violin with string orchestra) (2000) Commissioned by Monica Huggett and the Portland Baroque Orchestra. Funded by major grants from the American Composers' Forum and Meet the Composer. The crawl ball : for two violins, bass, and percussion (1998) Commissioned by Monica Haggett.